I haven't been a big fan of potato salads for most of my life. I always found them drenched too much in mayonnaise, or the potatoes overcooked, or the whole salad too bland... you know what I mean. I just spent a whole month in my home country Germany, which is known as potato country. Potatoes accompany any simple fare meal, like rice does in Asia. Either in form of dumplings; boiled potatoes, fried potatoes, potato salads. Being at home wet my appetite for potato dishes. Now here is my version of a potato salad: new potatoes with peel, some home-cooked legumes, fresh cherry tomatoes and some green leaves held together by a light yogurt-based dressing. The dressing is based on the ingredients of classic mayonnaise, only the oil and eggs are being replaced by yogurt. The mustard in the dressing provides a lovely zing. You can surely play around with the amounts of yogurt, mustard and lemon juice. I found the amounts mentioned below ideal. This light potato salad will be perfect for any BBQ or a light carb-loaded lunch. In fact, I had it yesterday after a workout on the treadmill. Wash and scrub the potatoes, then cut into quarters. Cook in slightly salted boiling water until soft, about 10 minutes. Check regularly, as you don't want the potatoes to fall apart. Drain and let cool. Cut potatoes into smaller pieces (if necessary), they should have bite size. In a small bowl, Combine all ingredients of the dressing. 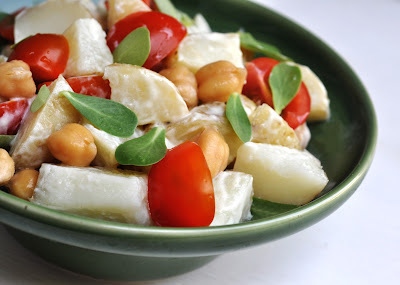 In a large bowl, combine potato pieces, chickpeas, tomato pieces and purslane (or other green of your choice). Add dressing and toss until well coated. Serve cold or at room temperature.